Once upon a time, I read a study that night lights and ambient light disrupts sleep, including for pets; however, sometimes children need a little light at night to transition to rest. Solar Sun Jar and Moon Jar Lights are the perfect solution! These LED lights in jars are powered by the sun, and they automatically turn on when it gets dark out. The light lasts for approximately five hours maximum, which is just enough time to put little ones asleep but not disrupt their rest all night long. Made from traditional mason jars, Sun and Moon Jars use a highly efficient solar cell to charge rechargeable batteries that power three LEDs. 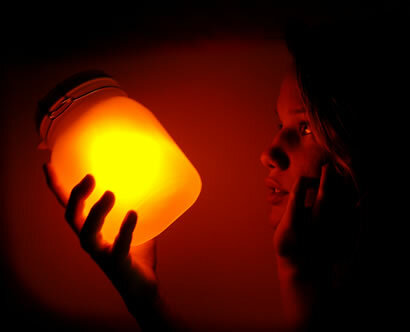 Leave the jar in direct sunlight for a few hours a day, and voila, you have an eco-friendly night light. The frosted glass gives off a soft light kids love. Our Solar Sun Jar and Moon Jar Lights happened to arrive on the day of my daughter’s first sleep over. These jars were a big hit with the girls, and I have to admit, I was fascinated by them too. As kids will do, they began to experiment with the jars by taking them into closets, the playhouse, etc. to see if they could trigger the lights. Further experiments discovered that direct sunlight outside works better at charging the Sun and Moon Jars than light through a window. The jars are waterpoof, so if you accidentally leave them outside over night, there are no worries. In fact, we were warmly greeted by our jars on the deck coming home in the dark one night. I’ve got one of these, and it’s pretty cool; although where I live there’s not much sunshine to charge it up!